Plug a USB Storage device into the USB port, make sure the USB light lit up on the router. Access the web interface of Archer C8 as an example. Please click here to access the web interface. 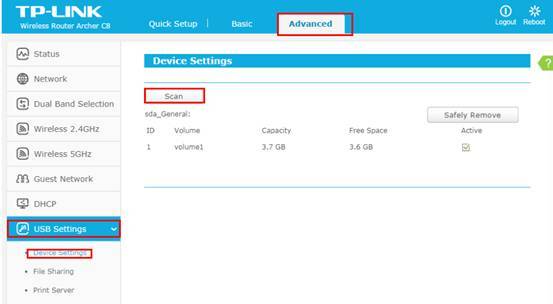 Click Advanced on the top, then click USB Settings -> Device Settings on the left side menu. Check whether the USB device is indentified by C8.If there is no device listed on this page, please click Scan and you may try unplug the USB device and plug it back in . Check the options FTP and FTP(Remote) to enable FTP server function. Check the option Require Login if you want to access with the login account. Set up the folders one by one on this page. Volume Name - From the pull-down list, select which volume to save the file under. Share Name - Name of the shared folder, customized by users. 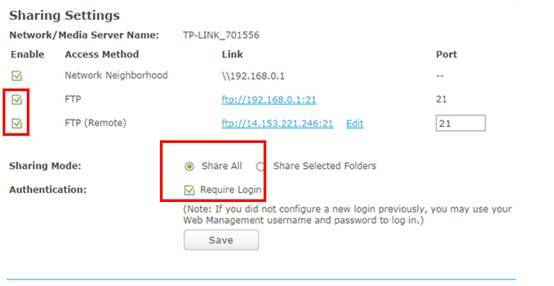 Allow Guest Network Access - Select the check box to allow the Guest Network to have access to the shared folder. Enable Authentication - Select the check box to require users to log in with a username and password. 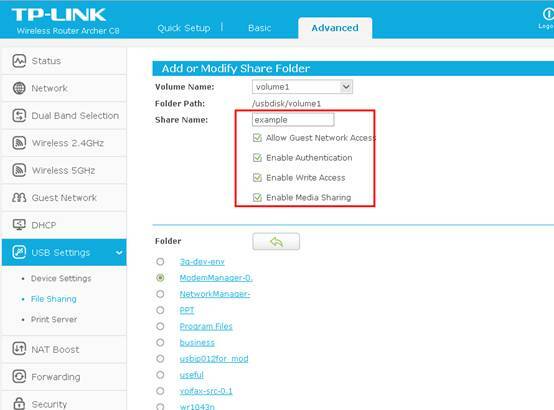 Enable Write Access - Select the check box to allow users to make changes to the folder content. 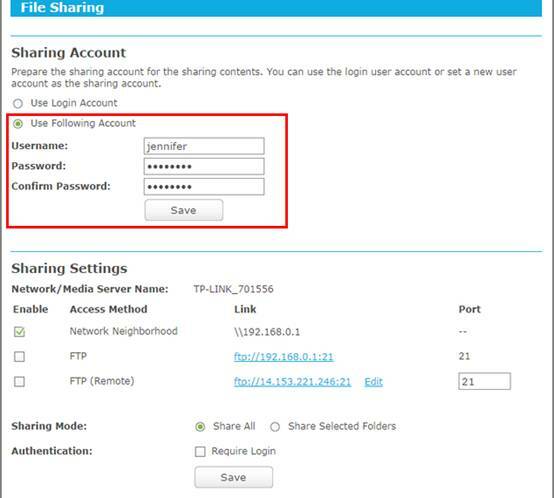 Enable Media Sharing - Enable media server function, you may click here to get more info. Now the FTP server can be accessed by local network. Please open the web browser and type in address ftp://LAN IP, press enter. 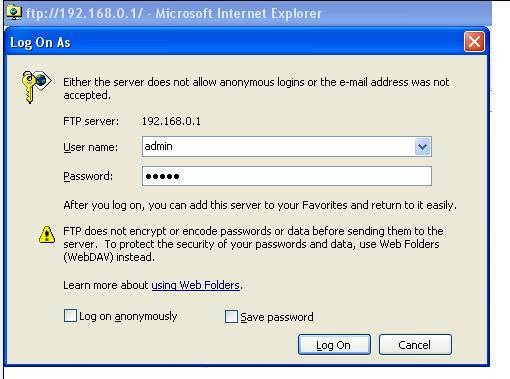 Then type in your account to access to the FTP server. Here the LAN IP address of the router is 192.168.0.1. 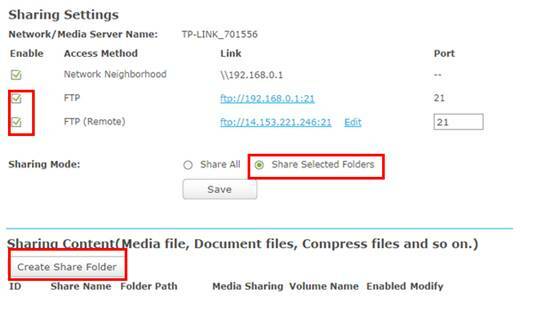 You can also access the FTP server by external network. Please type in address ftp://WAN IP to access to it.